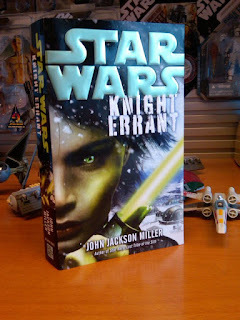 Faraway Press: The Online Home of John Jackson Miller: Knight Errant countdown: Three weeks to go! The novel has attained corporeal form! Del Rey posted the pic seen at left of Star Wars: Knight Errant on its Facebook page; it's due out Jan. 25. It's thick -- something like 400 pages, I believe. Three weeks from today: the countdown is on. And while I don't plan to give much away beforehand, here's a little hint about the setting depicted on the cover: it's definitely one of the planets that Vannar Treece describes in The Essential Atlas Supplement.